The rear bumper that came with My Truck is a silly thing. Big, plastic, heavy (for plastic) and low to the ground. 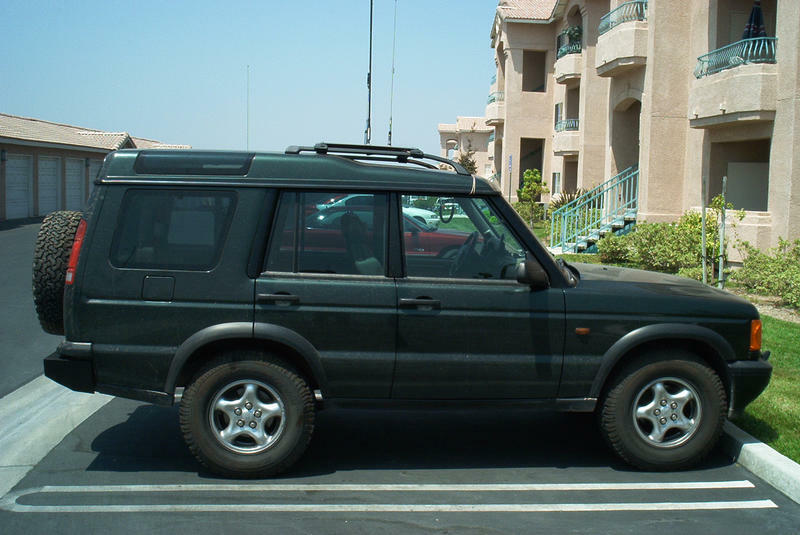 My very first trip to the desert, (Ironage Feb-03-2001)I dragged it on the ground, and dislodged the thing. 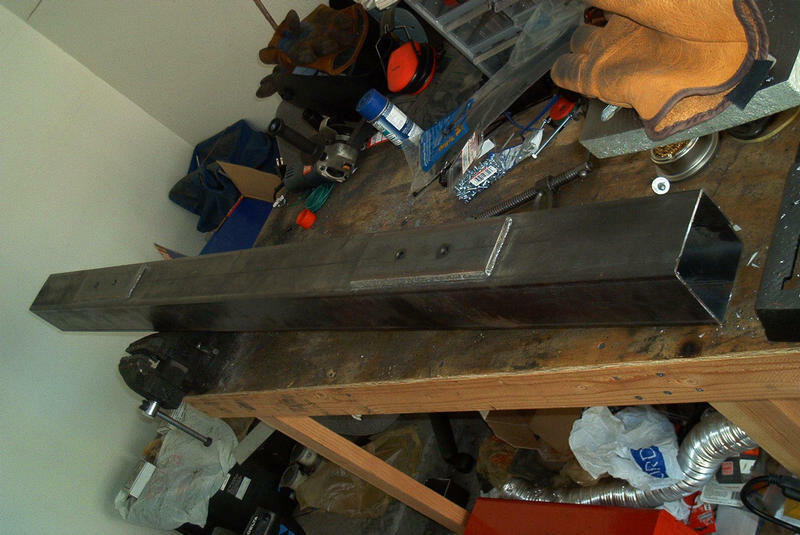 The first part of the project was making the main beam of the bumper. It is 4"x4" cold-rolled steel bar. I cut it to length, and drilled eight holes in it. Four 10mm holes for the bolts on the rear side, and four 1.5" holes opposite to get the socket in there. Next was making and welding on the spacing plates. 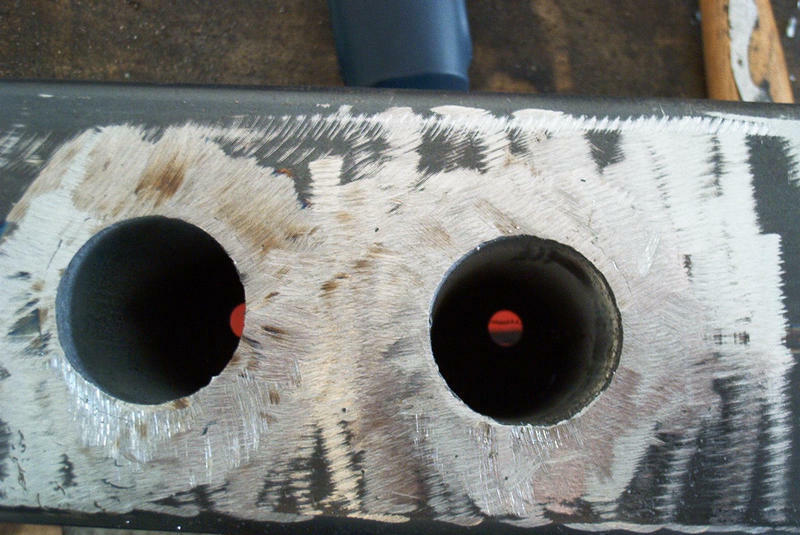 These plates have the same 10mm holes drilled in them, and are welded in place over the beam holes. These plates stand the beam 1/4" off the frame bumper brackets, which allow it to clear the body lip. They also act as giant washers, spreading out any pulling or torsional forces from the bumper to the bolt heads. The bolts holding the bumper to the rear of the truck frame go from the inside rear of the main beam, through the spacer plates. That means that when in, the bolts must be accessed through the large holes in the front of the bumper. I dicided that I wanted these holes to be larger, and to be lined, so that if I drop the bolt, it isn't lost forever in the beam. So, what I did was to widen the access holes in the front of the beam tube to allow me to weld in place four 1.5" ID pipes. 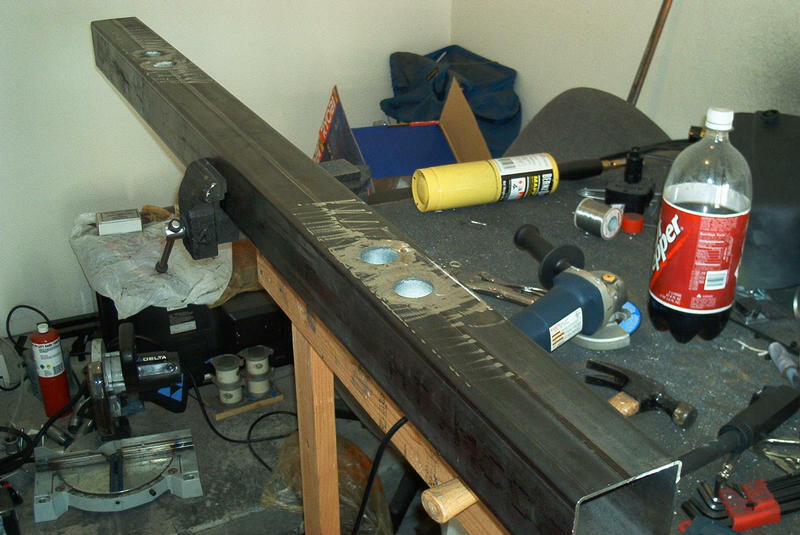 I then ground these flush with the front surface of the beam. These are not structural, but simply keep me from losing bolts. The ends of the bumper need to wrap arround the rear sides of the truck, and reach down to the bottom of the 'quarter panel'. I dicided to acomplish this by welding 4"x1/4" steel panels to the sides, two at 15 degres in-turn angle, and one at 30 degrees. 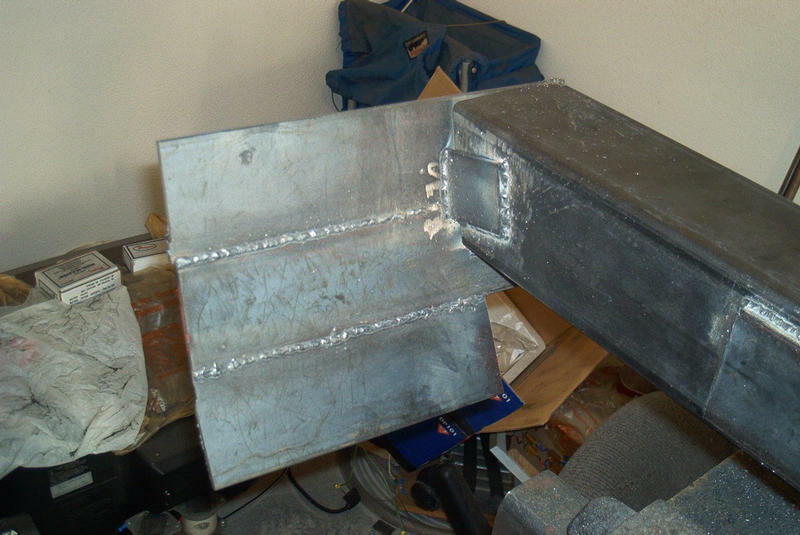 These panels are welded together length-wise, and attached to the main beam by a weld across the front of the beam, and by two bridging brackets on the bottom and rear. 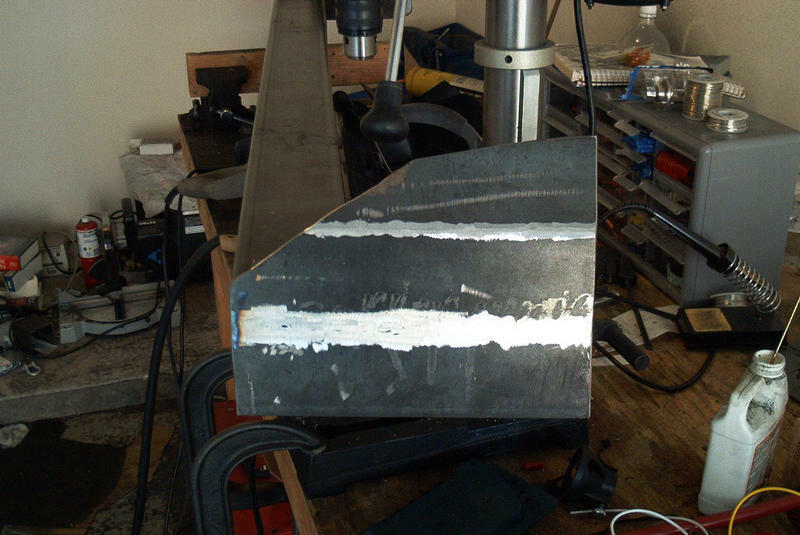 Once the caps were welded together and attached to the main beam, I trimed off all the extra material, giving it a smooth upward angle from the rear of the truck's quarter panel, and ground smooth all the external welds. The entire assembly laid out before mounting. 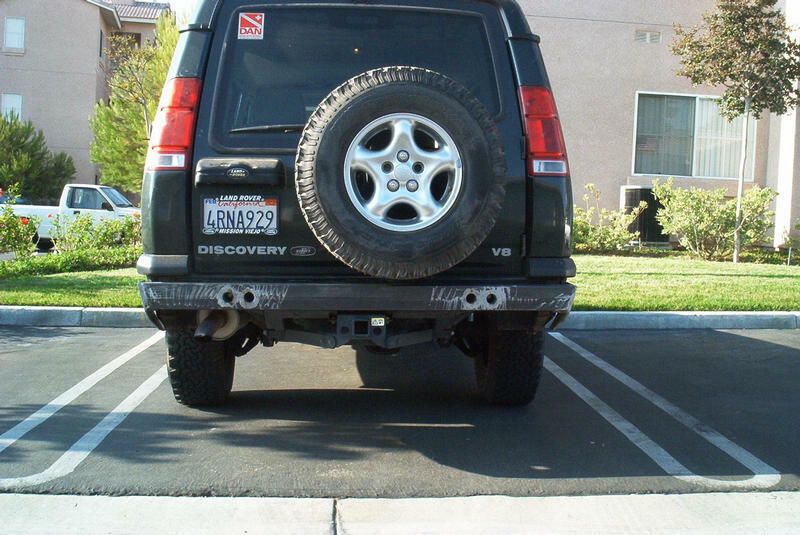 The mounted bumper. I like it. It turned out 90% as well as I had hoped, which is far more than I expected. I still need to attach it to the truck frame in one or two more places, put a non-slip surface on the top, and paint it, but it's pretty much done! It weighs about 60 pounds, so the rear of the truck isn't visably lower, and I can lift it myself. I was worried that when the side panels drag on somthing, the resulting twisting force on the bolt heads holding the bumper to the frame might be too much. 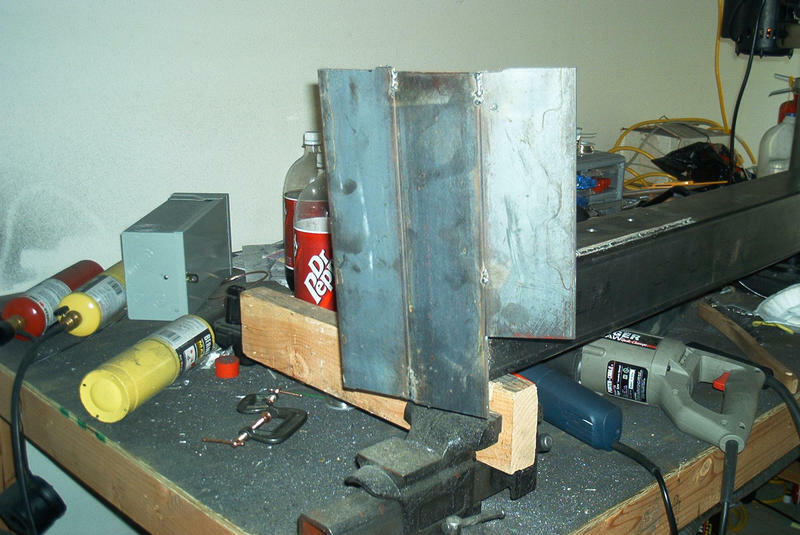 So, I welded two 2"x2.25"x.5" tabs to the bottom of the main beam, which allow me to bolt the tabs directly onto the beefy trailer hitch. 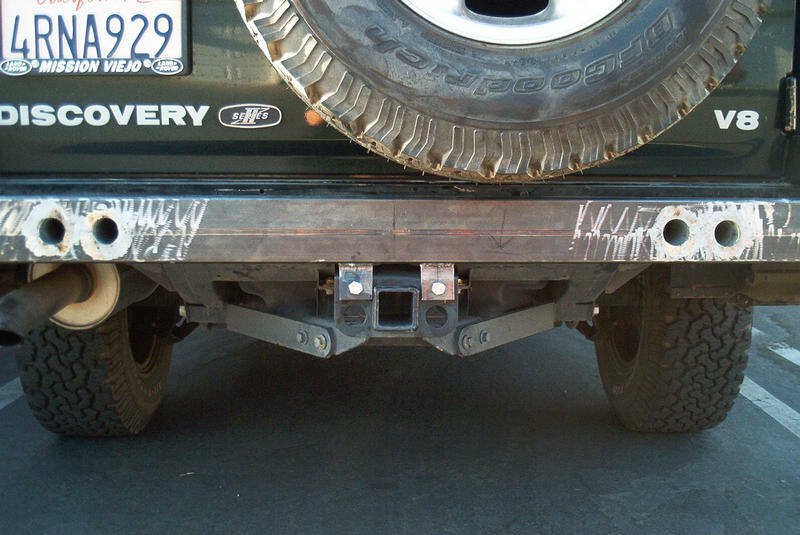 That way, if the bumper wants to twist, it's either pushing or pulling on those tabs, instead of trying to snap off bolt heads. I dicided to forgo the quarter-panel sliders, since the rear corner of the bumper would hit ground first anyway. So I dicided to wrap-up this project. I sealed up all remaining holes (mostly where the caps met the beam) except for one 'drain hole', and painted the thing. Three coats of matt black rustolium, and I'm done. Once I got finished bolting it onto the truck, it was after dark, so final pics tomorrow. Can you belive I actually managed to strip a 12mm nut? Sigh... Oh well, there are five other bolts holding the thing on while I figure out how to get that one out. Done! Done! All done! The thing is solid as a rock, and I think looks great! I can't wait to drag it on a rock. Matt Bell (2002-08-02): Wow! That looks great! You might think about getting it hot dip galvanized before you paint it to make it rust proof. Erik (2002-08-04): Thanks Matt. Galvanization would probably be good, but I think that'd be overkill. The rustolium should do a pretty good job protecting the outside, and the drain-hole combined with the So. Cal. sun should keep the inside just fine too. Mike Bullivant (2005-01-30): sun, whats that..i live in the Uk. You've done a great job on the bumper ..its given me some inspiration. Erik (2005-01-30): Great! Good luck Mike. Ali (2005-02-11): Looks good and a nice, simple approach. Here're some constructive critcims: unless you're going to be installing a set of 35"s, I'd be thinking of protecting that huge rear end! I know you're not concerned with departure angles but it only takes one rock to crush the rear quarter panel and ruin your day. You have a nice foudation to work off of. The rear wing will do a nice job keeping light stuff off the body work. If you put too much side ways force on them, they'll contact your body. 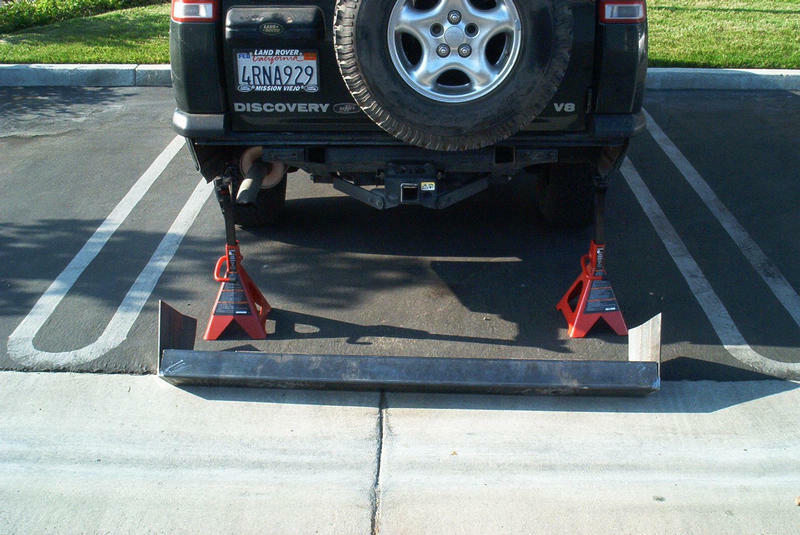 Have you thought about integrating the hitch receiver into the bumper design? Again, these are constructive criticms only, no offense intended! Erik (2005-02-11): Thanks Ali, I agree. The quarter panels are more protected than they were, but still not enough. 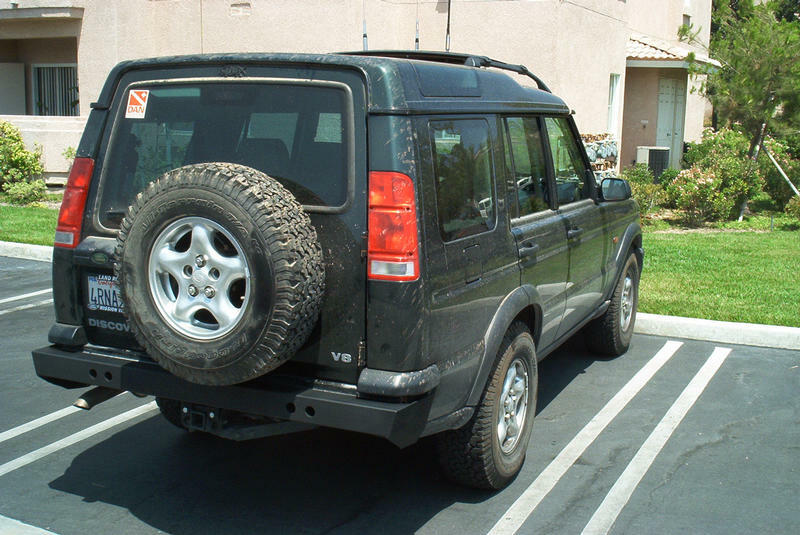 My next rear bumper design will involve cutting back the quarter panels, as well as integrating the trailer hitch (and in so doing, raise it a few inches), as well as integrating more visable reverse lights. However, I'm in no rush. This bumper has served me well since it's first day on the job. Erik (2005-02-11): I like it! Awesome work! 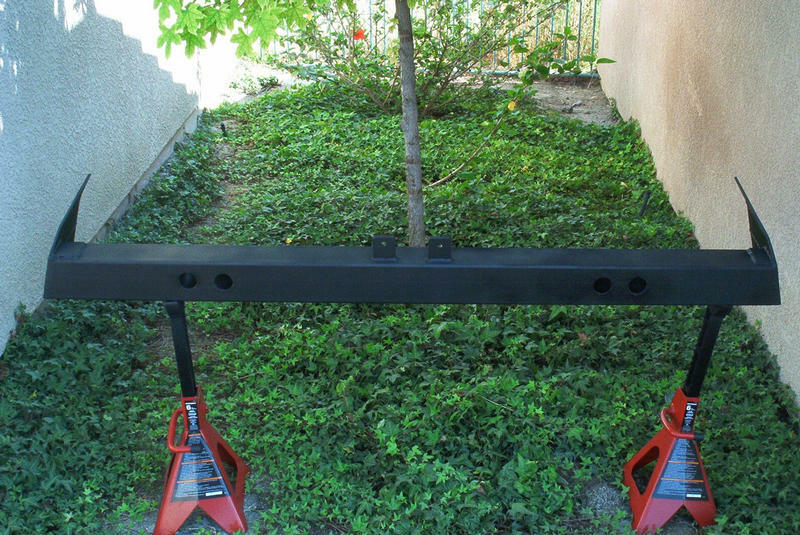 I have heard of the rockware bumpers too, they look good, so does the Greg Davis bumpers, as well as a few other company's. There's getting to be a number of choices for DII owners. Good for you for bringing the beas of of your cruiser! Erik (2008-05-19): Cody, actually a lot of people do just that, and it works reasonably well. 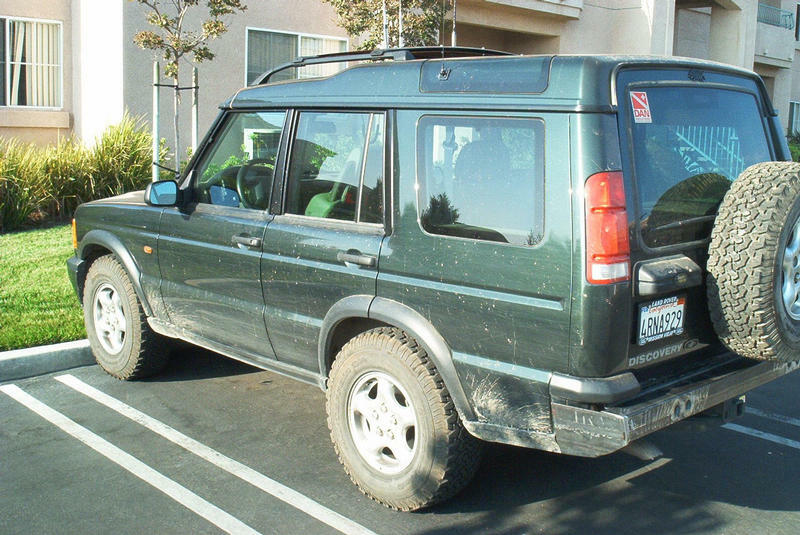 However, for a single tire, like a flat, I don't think using a pump is too painful, and when it really counts, like airing up all four tires from a 15psi sand trip, the bumper doesn't have enough air capacity. I prefer to use a tire-inflator adapter on a SCUBA tank, which is small, and since I already have the gear, inexpensive. A lot of other people use CO2 tanks, like the powertank. 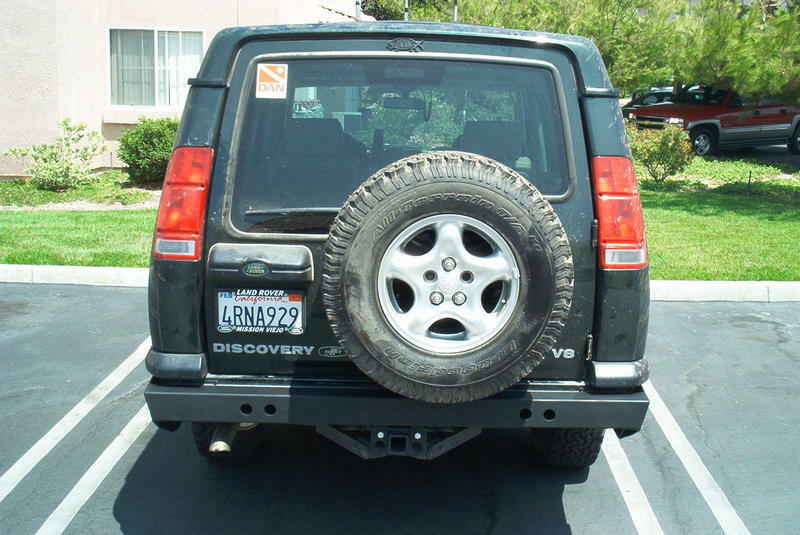 Chris (2009-06-10): Where & how did you relocate your blinkers that were on the existing bumper? I mounted white flood lights to the bumper to act as my reverse lights, and wired them in to the existing signal lamp wiring harness. I then wired the turn signal lamp wires into the old reverse light wires, and installed yellow-colored bulbs into the old reverse light sockets. I like this arrangement much better: More powerful reverse lights, and more visible turn signals. Rugby (2010-08-10): Rustolium makes a great brush on bedliner that i undercoated my truck bed with. I'm looking to buid a bumper and will coat with that.